Jane Oakhill on her research journey and how it helped. After graduation, with a degree in Biological Sciences and Education, I worked as a primary school teacher for two years. During that time I noticed that some children were very good at word reading, but had problems in understanding what they had just read. The tradition then was to hear children read individually (from their current reading book) to the teacher for a few minutes to check out their reading. However, I didn’t leave it at that… I talked to them about their reading. For me, it was just a page or so from the middle of a story. So, I asked them what was going on in the book, whether they were enjoying it, and what they thought might happen next. Whereas some children were very able to talk about the book and had a clear idea of what the book was about, others really had trouble. I remember one eight-year-old boy in particular who was an excellent reader, in terms of word reading, but when I asked him about the book he was reading he seemed to be able to tell me almost nothing about what had happened in it. Indeed, he seemed to think it rather odd that I should want to know. Prior to starting teaching, I had wanted to do research but, in fact, the choice of children’s reading comprehension as a topic was serendipitous. When I finished my first degree, I was hoping to do a PhD in Biological Sciences, specifically on circadian rhythms in locusts, but (probably mercifully) I didn’t get the funding. So I went into teaching, and then by a rather circuitous route (via the Education Department at what is now the University of Brighton) I started to develop an interest in psychology, and psycholinguistics in particular (initially inspired by Dan Slobin’s book Psycholinguistics). I was able to move my doctoral funding to the Laboratory of Experimental Psychology at Sussex. The fact that I didn’t have any background in psychology didn’t seem to faze the then head of the lab, Stuart Sutherland. I still needed a topic for my doctorate, and it occurred to me that my observations about discrepancies between children’s word reading and text comprehension competence could make for an interesting research topic: why is it that some children become competent word readers but fail to understand what they have read (even though they might have no specific problems with understanding everyday spoken language and are good communicators)? Another serendipitous development was that the person who was originally allocated to be my supervisor at Sussex left the university and, as luck would have it, I was taken on by Phil Johnson-Laird, whose seminal work on mental models in text comprehension and reasoning was instrumental in shaping my thinking both then and ever since. I think that at that time (and to some extent, still), people simply thought that learning to read meant teaching children to recognise the words, after which their language competence would kick in and it would all come together. It became apparent that that was not necessarily the case, probably in large part because reading and understanding books is different from understanding spoken language in important ways. The language of books is a different register: books have longer, more complex sentences, more difficult vocabulary, and of course they cannot be interrogated in the way that an interlocutor can. This problem fascinated me, and when I started my DPhil, probably like many doctoral students, I thought I was going to solve problems and change the world (at least in a small way). What happened in reality was that, 13 experiments later, I had made a tiny bit of progress in understanding the problems that these children (who came to be called ‘less-skilled comprehenders’) have, and was also able to rule out some possibilities. In particular, it was not the case that the children just had poor memory for the text they had just read. The main problems I identified in less-skilled comprehenders were to do with difficulties in making inferences from text and connecting what they read with their prior knowledge. After completing my DPhil, I moved on to other things (for instance, I worked on grant with Phil on deductive reasoning for a couple of years), and it was really other people’s interest in the work on reading comprehension that encouraged me to go back to that area. With further ESRC funding, including a grant with Alan Parkin, and input from my wonderful DPhil student Kate Cain (who is now a professor at Lancaster University), the evidence gradually accumulated. In the 1990s, Kate continued to work with me and Peter Bryant as a postdoc on our combined longitudinal and cross-sectional study. When I began my DPhil research, reading comprehension was a largely unanalysed construct. So, if some children were not as good at it as others, how could one go about improving their comprehension? My research has provided more information about the components of reading comprehension skill and their importance in children’s development. Many of the ideas for the research came from work and theory on understanding of reading comprehension in adults. Thus, my research began to deconstruct reading comprehension and I (in collaboration with Kate) found four main component skills that, both together and independently, contribute to the overall reading comprehension skill in children. First, vocabulary: not just knowing the basic meaning of words (as is required by many vocabulary assessments) but knowing more about the words and their associates – not just a superficial knowing, but a richness or depth of vocabulary). For instance, superficial knowledge of the word platypus could enable a reader to match the word with a picture of a platypus, but greater depth of knowledge about the word might include the information that the platypus is one of only two egg-laying mammals. Of course, knowing the meanings of words is fundamental to text comprehension, because it is clearly not enough just to be able to decode words to sound: we have probably all had the experience of being able to read a word aloud, at the same time being aware that we do not know what it means. The second contributory skill is inference-making. Inferences are needed both to link the sentences within the text to create a coherent overall text, and also to link the text with relevant background knowledge to support understanding. For example, if we read the two sentences ‘The student carelessly discarded the burning cigarette’ and ‘The fire destroyed most of the trees on campus’, we assume that these sentences are probably causally linked, and are likely to make a causal inference about the relation between the fire and the discarded cigarette. A third aspect is comprehension monitoring. This is the ability to understand one’s own comprehension; to reflect on what has been read and consider whether it makes sense or not. This meta-cognitive skill involves not only detecting lapses in understanding, but also knowing what to do about that lack of understanding: whether it be stopping to look up, or work out the meaning of, some words, re-reading a part of the text, or deciding that the book is just too boring or too difficult to bother with. The fourth area is knowing about the typical structure of texts. This type of understanding can guide the reader’s expectations of the text. So, for instance, in a story there might be an introduction of the main characters and setting at the beginning, later on the reader might be expecting a main event, or series of events (the main point of the story), and so on. Not only do less-skilled comprehenders have trouble understanding basic aspects of story structure, like the point of a title, but they also have problems in the oral production of coherent, well-structured stories, and their stories often lack a main point. These are not necessarily completely independent skills, and we are currently looking in more detail at the interrelations between them. For instance, recent studies have explored the relation between vocabulary (especially depth) and inference skills. The findings indicate that deep vocabulary knowledge and, in particular, rapid access to that knowledge, can support inference-making by facilitating associative links between words and concepts in a text. Importantly, various studies now provide evidence for a causal relation between each of these four skills and reading comprehension. This is not necessarily a unidirectional causal relation, but obviously if there is a causal relation between these skills and comprehension more generally, then the skills will be good candidate cases for training to improve reading comprehension. I have always been keen to talk to teachers and teacher educators about my work in the hope that the findings and ideas might influence their own work and, in particular, how they handle children with comprehension difficulties. But it was not until the Rose Review of Reading in 2006, which cited many of my and Kate’s studies, and the subsequent revision of the National Curriculum in 2008, that attention was really focused on the importance of reading comprehension, and of teaching children to read for comprehension. Around that time, teachers, teacher educators and educational professionals more generally realised that there was a need to teach and support reading comprehension specifically. Thus, although I began quite idealistically at the beginning of my DPhil – believing that my research might have the potential to influence the teaching of reading in schools (and I always thought of my research findings as applicable, even if the research itself is not applied) – the real-world application of the research turned out to be a long, slow process. It wasn’t until about 30 years after I started my DPhil that the applications began to be widely realised, and that the research findings began to have what we now refer to as ‘impact’. In the wake of the Rose Review and the recommendations in the National Curriculum, people began to think about materials to help the teachers support reading comprehension. Thus, Tony Whatmuff, who was working for Leicester LEA, and quite unbeknownst to me, started producing materials and training for teachers, based on a small-scale training study I had done (in collaboration with Nicola Yuill). Those materials have been developed since (based more broadly on my own and others’ research), and are now used across the UK. At about the same time, a group of educational psychologists in Argentina had developed and published a set of materials inspired by my and Kate’s research findings. Those materials are, in particular, based on the key findings from my own research, and emphasise the four key skills we have shown to be causally implicated in the successful development of reading comprehension. I have often been asked if I wish that I had had the idea to develop and produce research-based training materials myself, but I believe that it is important that it is someone else who has independently seen the potential to apply the research findings. In addition, the people who have developed the training materials have the crucial experience in the educational environment, and have the critical insights and skills to know what will be appropriate and what will work in a contemporary classroom context. I think that where this research base has made a difference is in raising awareness of the importance of teaching reading comprehension skills, and making this task more manageable by helping teachers to understand the underlying component skills. Thus, it is crucially important to give teachers information about what reading comprehension is about so that they can see it as the product of a number of skills, each of which can be explicitly taught to children. For instance, if a teacher really understands what it means to make an inference from a text, then they can convey that information to children in a quite explicit manner. This need to help teachers understand more about the research behind reading comprehension motivated our 2015 book Understanding and Teaching Reading Comprehension. The ability to teach comprehension effectively depends on so much more than presenting a particular text and specific questions about it, which can come across as rather mechanistic. What is important is that teachers have a good basic understanding of comprehension skills so that children can be taught and supported to apply those skills to any text. It is likely that a deeper understanding of comprehension will also help to increase teachers’ confidence, and probably also their enjoyment of teaching reading comprehension. Teachers also need to have the confidence to appreciate the important role of oral language and extensive discussion in their reading lessons: lessons in reading comprehension need not necessarily include much actual reading! Effective comprehension is a very general skill – it is not something that is important only in literacy lessons, but is needed for all school subjects and, indeed, for interacting with the world more generally. Indeed, in Argentina the children themselves said that the strategies they were learning in their reading lessons were so useful that they wanted to apply them in other lessons (including maths and science). Throughout my academic career, I have always taken the opportunity to talk to teachers and teacher educators when I have been invited to do so, and I also try to publish some of my research findings in outlets that will be accessible to teachers. The fact that people have started taking up and using the research findings, and that I am receiving more feedback about the relevance of my research, has been very motivating. It is a very good feeling that the accumulated research findings can be used and can make a difference. So now, even though I am still doing research in other areas of cognitive psychology, I am consciously focusing my efforts on this particular research enterprise. What has been clear is that effective teaching of reading comprehension has an impact not only on the educators but also on the children. Those children I have seen using the teaching materials seem very motivated to apply what they are learning about comprehension to their reading and learning more generally. When comprehension is taught well, children are enthusiastic to discuss and engage with texts, and through that engagement develop the joy of reading. Thus, it is likely that far fewer children will read with as little comprehension as the boy in my class did all those years ago. 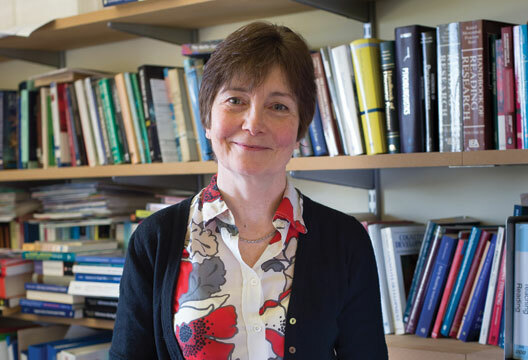 - Jane Oakhill is Professor of Experimental Psychology at the University of Sussex.